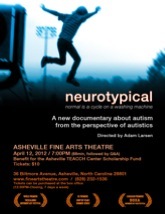 Come see Neurotypical and support the Greenville TEACCH center! Proceeds will go to the financial assistance fund for families seeking services at UNC TEACCH - Greenville. 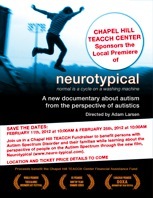 Chapel Hill TEACCH Center screening! Join us in a Chapel Hill TEACCH Fundraiser to benefit persons with Autism Spectrum Disorder and their families while learning about the perspective of people on the Autism Spectrum! 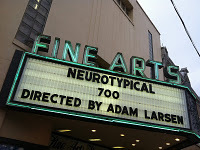 The screenings in Asheville were amazing! We couldn't have asked for a better turn out - completely sold out on Thursday night and over 200 (out of 250 tickets) on a Saturday morning! And to top it all, we raised almost $4000 for TEACCH!! Join us this Thursday, September 15 at 7:00PM and Saturday, September 17 at 10:30AM at theFine Arts Theatre in Asheville, NC for a screening to benefit the Asheville TEACCHCenter's scholarship fund! It's wonderful for Neurotypical to come home to Asheville where it all started!